Still moving along slowly here, but slowly is definitely the operative word. I've done a lot of thinking, a bit of moving stuff about and made quite a few hourglass blocks, in a fairly random selection of sizes. I have decided I'll just keep chopping up the one floral fabric and making blocks with it until I run out. While I do that I will also slowly add a few more bits and pieces into the mix, and I'll carry on making bigger bits, when the fancy takes me - you can see one taking shape in the corner of the photo. I am actually slightly further on that this, but failed miserably to take any pictures after this point; sometimes I am just way too easily distracted! On another, more interesting topic than my current inabilility to get to grips with this project, it's AHIQ time again and Ann is launching the next challenge. I'm quite excited by the prospect, and may contemplate starting something new before this one is done, just so I can join in. Good plan good plan to use up the floral and work other bits in. I think you will have a good combination of quiet and loud, print and solid when it's used. And I swear I will try this way of working soon rather than my method of forcing (or at least attempting to force) fabric to submit because I cut a bunch at a time. Accretion works well with improv. It allowed was more time for reflection and results in less waste. I like your process here - sadly I haven't made any on AHIQ, I shall try and remedy that!! I am loving the fabrics and colors you're bringing together on this project! There's a vibe here I can't quilt put my finger on, but it's very appealing to me. Am sooo.. curious to see where this is headed! Thanks for the AHIQ linkup once again! It's been so good to motivate me in moving forward with my own improv. learning! I like your way of gradually working in something else, not only from an artistic viewpoint, but in spreading fabrics out in case something runs low. 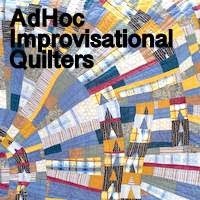 When I read Ann's idea for words on quilts, I immediately thought of you. I know you'll take that theme in interesting directions. I didn't have anything particularly ready to link up this time around - but I am most intrigued by the newest challenge for the next quarter.